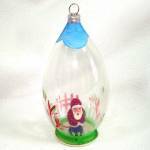 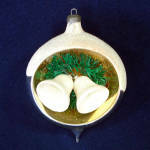 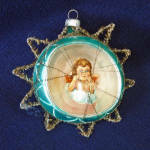 This fancy indented diorama style blue glass Christmas ornament has a scrap paper angel or cherub in the center surrounded by a puff of pale pink cotton. 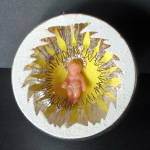 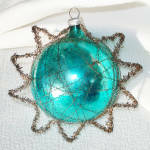 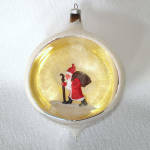 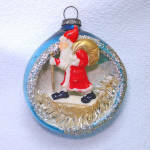 The ornament is encircled by a wired tinsel star and is wrapped in crinkly gold bullion wire. 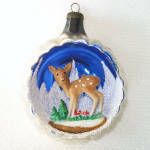 It was made in Western Germany in the late 1940s to early 1950s. 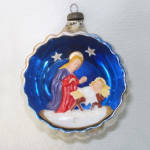 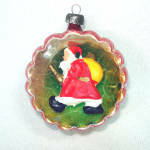 The ornament is about 3-3/4 inches diameter including the star frame. 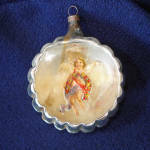 There is some minor paint wear to the back from rubbing of the wires, and a little clouding of the center indent from deterioration of the inner silvering. 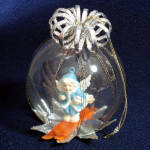 The angel and cotton cloud slide a bit, apparently the glue holding them in place didn't hold. 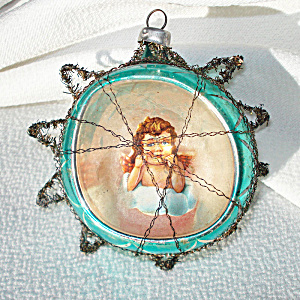 There are no chips or breaks.